I'm a big girl now - I sleep in a big girl bed!!! After sleeping on a mattress thrown on the floor for over 10 years - I finally found a bed that I like, and I bought a new mattress too! We got into an old house that is being cleaned out, where we found this bed, which is a Victorian Arts and Crafts style handmade bed. And we also found the old wicker desk, I think my dad was buying it to resell, but I made it mine! We also bought this little curio hanging shelf thing. 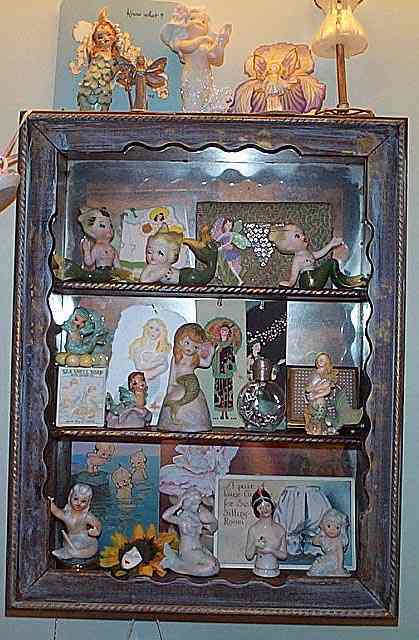 It's not very old, but it's great to hang in my bathroom and display my mermaids & stuff. 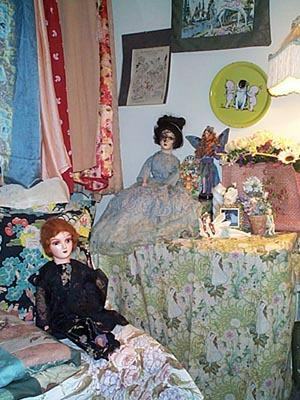 The other picture is also from my room with my covered storage and my boudoir dolls. 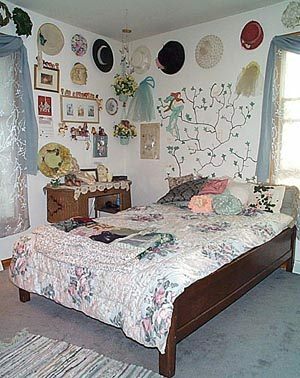 I nailed up a clothesline along the top of the wall and I hung some of my favorite lingerie & lounge pieces up there. Mainly silk emboidered robes. I wrapped a peach feather boa along the top to cover some of the rope. This is in our downstair's room. My Dad bought my Mom this piece of furniture - an armoire? I'm not sure what you would call it. 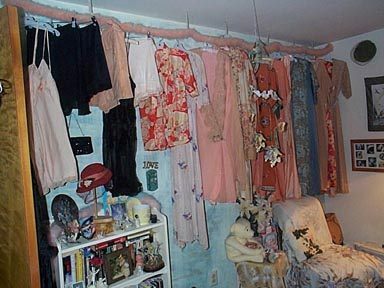 He thought it would be nice for her to hang some of her Victorian children's clothing that she collects. It was very nice for that, and for some of my stuff too!!! The shoes, hats and lingerie boxes are mine. 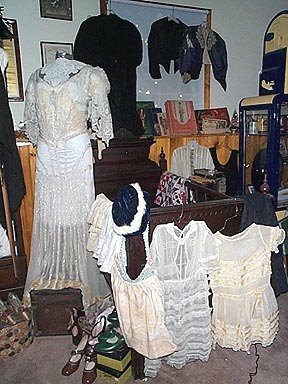 To the right on the mannequin is my Mom's prize find - a sheer net Victorian wedding gown with velvet and tons of beading. 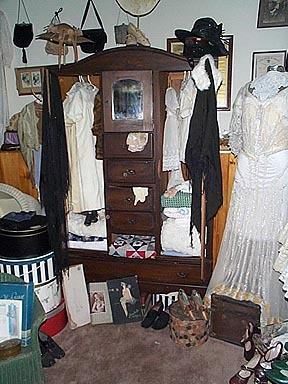 Here is a closer view of the wedding gown and the children's clothes hanging on the old wooden crib. I think the crib belonged to a cousin of my Grandmother's. Here are 3 quick pictures of some goodies that I got at the flea market. First is a silk floral step in/wrap around lounge pajama from the 1930's. I love vintage loungewear from that time. Those were the days when people had nothing to do, I wish that I had time to lounge! Next is a white rayon jersey halter gown and matching bolero. The gold pieces on the waist is leather. Lastly is a champagne satin bias Jean Harlow-like gown. It's my first Harlow gown, I have been lusting for one for a while now. I was very excited to get it, even though it has stains. It is a true evening gown, night a nightgown. It a halter (hard to see on my mannequin) It has inter-looped straps on the back. It has a side fantail on the back. Yummy! I don�t come across very old items too often, so I was very happy to find these 3 items, together, just this past weekend. They are from the Teens to early 20�s. The navy dress has a million hooks, sheer collar and trim and beading on the bodice. The green is a wool walking suit with bakelite buttons. The black cape is silk with long fringe, that ties in the front. 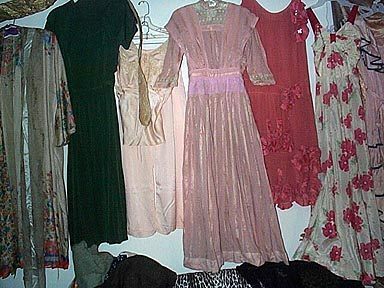 The 4 dresses above came from Martha, a great & very fun lady that I buy alot from. Some of you may have heard me speak of going and digging through her garage, well these dresses came from those trips! The gold is a silk velvet bias gown from the 30�s. The purple was originally blue, I think. But is was faded and discolored, I tried dyeing it, but the color came out uneven, so I decided to keep it. It has 2 beaded birds on the front. The black is a fabulous rayon 1940�s dress with bold grey flowers. I love it! I may eventually sell it, but for now it�s hanging on the wall right above my computer. Lastly is a pink ruffled dress with blue velvet trim, from the 1930�s. 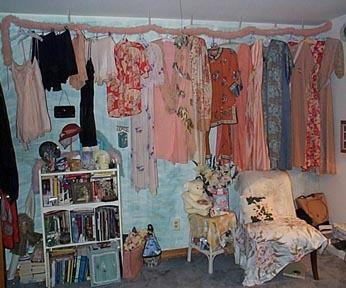 This picture is a mass of dresses hanging on the wall in my computer room. I am quickly running out of room!! I bought this dress from Dorothy, she is a lady who has been collecting vintage clothes for over 20 years, and has a really great love for vintage fashions. 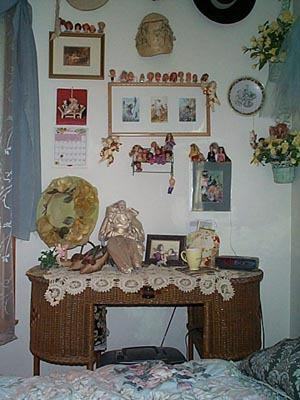 Because of her health, she is moving and selling many of her things. I bought about 28 dresses from her (so far) and this is one that I decided to keep for myself. It is silk lace and silk lined, from the 1920-30's. The lining is shattering as we speak though. You can see it has ripped and fallen down from the bust area. Just the weight of the skirt was ripping the lining, it is so delicate. I am going to have to find a pretty open top box to display this, since I won't be able to keep it on my mannequin, or even hang it. It's hard to see in the photo, but the bottom edge is cut on an angle. I just love anything green! I actually missed this dress at an auction I went to. We left because it was getting late, we had far to drive home, and my Dad was falling asleep in the chair. But a lady that I buy from all the time was at the auction too that night, and did get the box-lot that this dress was in, so I ended up getting it from her after all. 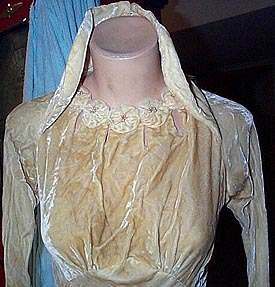 It is a silk velvet wedding dress (yellow from age) I think it is from the 1930's. Full length with attached train. Look at that collar! It has gathered flowers around the neck, and a ton of buttons down the back. There are several stains besides the discoloring. 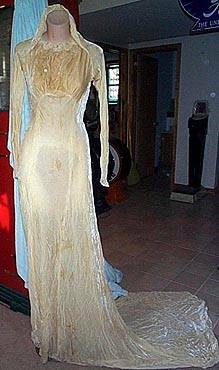 I kept it on my mannequin and admired it for awhile, but I did eventually sell it on ebay for $96 . These are great glove for a New Year's Eve party! 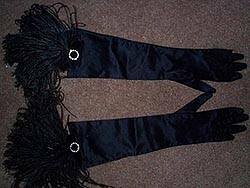 They are black stretch satin with feather plumes at the top, with a little ring of rhinestones. Very dramatic. This is a great handmade bathing suit from the 1940's. It is a twill cotton with floral print. The sides are very risque with peek-a-boo panels with loops and some of those great 40's plastic floral buttons. 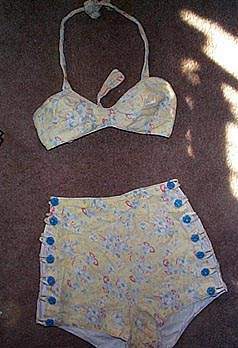 I bought this from Edna, and she jokingly said that some 1940's girl must have made this bathing suit, hoping to catch herself a returning serviceman for a husband! I just though it was so great, and had to keep it for myself. 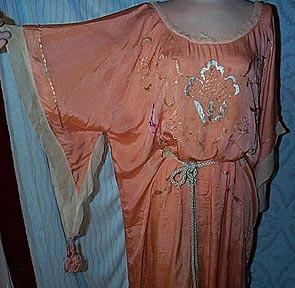 This is a great silk lounging robe from the 1930's that I bought from Edna. It is peach silk with rayon floral embroidery. It has kimono sleeve with ivory crepe silk trim and tassles. It has blue rayon cord drawstring in waist. I will keep it on my mannequin and gloat over it for a while. It does have some stains, and the color from some of the embroidery has ran, but is still a nice piece. This is the very prestigious gallery of the most fashionable women (in my opinion) Many are begging to be included, but only a shining few are given the honor. To be fair to the ladies, they are listed in no particular order and not according to rank of fabulous-ness. 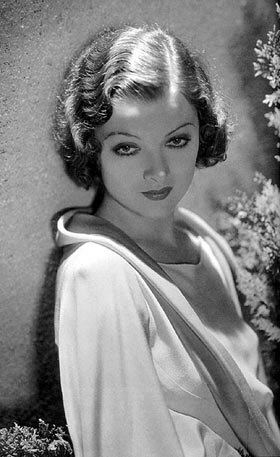 Myrna Loy ~ She was the most glamorous wife ever when she played Nora Charles in 'The Thin Man' movies with William Powell as her Nick. She wore fabulous 1930's style dresses while solving crimes and mysteries. She also wore the most incredible bedclothes, of course she and Nick slept in seperate beds back then, when movies weren't allowed to show men and women in the same bed, even though they were very happily married, like these 2 were. I'd get married if marriage was really as fun as Nick & Nora made it seem. 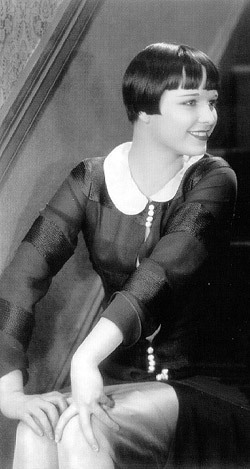 Louise Brooks ~ The ultimate 1920's flapper girl. She is fabulous for the way her clothes and hair show her personality - bold and brazen. She was legendary for standing up for herself and making demands on her own behalf. No one was going to boss her around. I love that sharply cut black hair. Audrey Hepburn ~ All bow to the Goddess Audrey. Everyone already knows she was so fabulous as a young girl, and so very elegant as a more mature woman. She just seemed so kind and lovely. Of course 'Breakfast at Tiffany's' made the 'Little Black Dress' famous, but I wanted to choose a different photo. Here she is kind of a Pixie-Prom-Princess, total perfection! Dawn ~ The ultimate Foxy 70's babe. She had the most groovy and stylish clothes, you couldn't find real clothes like those in the stores. I prefered Dawn over Barbie because she was more petite and not as full-figured as Barbie (No offense to Barbie fans) I am a petite girl myself. Jean Harlow ~ Queen of the bias cut gown, fabulous 30's glamour girl. I know she isn't wearing a bias gown in the photo, but I couldn't find a photo of her in one online. 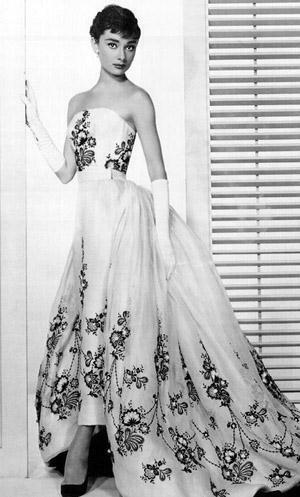 No one looked more fabulous in a bias gown than her. Although, the story goes, that she was sewn into her gowns daily, and they were so tight, she couldn't sit down during breaks in making her movies. They put her on some kind of a slant board to take the weight off of her feet. Now that is suffering for fashion! Elizabeth Taylor ~ Now I am not a big fan of Liz, but there is no denying that she looked fabulous in movies like 'Giant' 'Cat on a Hot Tin Roof' Here she is making a simple lacey slip look fabulous (although this isn't a very good picture) My slips don't fit me like that! they just kind of hang on my body.